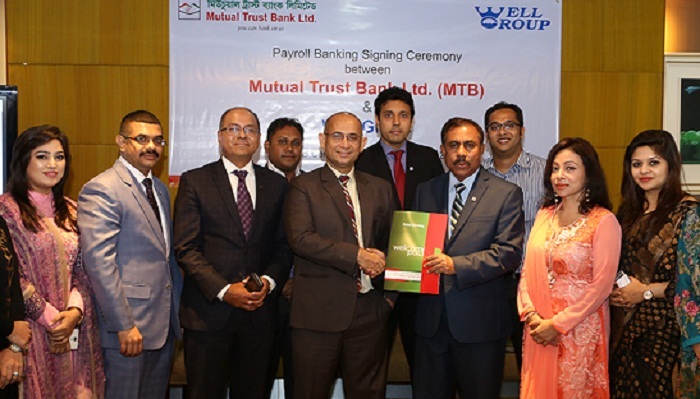 Mutual Trust Bank Ltd. (MTB) has signed an agreement with Well Group for Payroll Banking solution for the employees of Well Group at MTB Centre in city’s Gulshan Avenue recently. Syed Rafiqul Haq, Deputy Managing Director & Chief Business Officer of Mutual Trust Bank Ltd. (MTB) and Syed Nurul Islam, Chief Executive Officer of Well Group signed the deal on behalf of their organisation. Md. Ikbal Hossan, Assistant General Manager, Accounts & Finance, Abdur Rahman Mahbub, Manager, Corporate Communication of Well Group, Tarek Reaz Khan, Head of SME & Retail Banking, Irfan Islam, Head of Privilege Banking, Sultana Shikder Ahona, Head of Payroll Banking of MTB, and other officials of the both the organisations were also present at the occasion.